Equip: Fancy Acid Etched Plate armor, Shield, Scimitar + 1, 2 Hand Axes, Riding Horse, Scrapple and Bacon - attack lizards (dogs). Alignment: Neutral - Huxley is a calculating pragmatist, he's not especially quick to anger and is mainly concerned about his own welfare and wealth. In the past he's done some pretty horrible things, and he could easily drift back into a life of theft, betrayal and murder. Lately certain events, including his own near death, a curse that made him relive the deaths of those he's killed, and the cannibalistic depravity he's witnessed in Denethix's slums have made him more thoughtful and he might even be drifting towards the law. Huxley "Hux" McTeeth is a shortish (5' 7") man, of a medium build, in his early 40's. He sports a fierce mustache, but otherwise he was born with rather unremarkable features. His recent life of adventuring, more so than his many years as a gaucho and plains' tough, have marked him. Not the least of these marks is a set of terrible burn scars on his face, arms and torso received when Hux attempted to test an ancient laser pistol and found out what a corroded high energy cell can do. 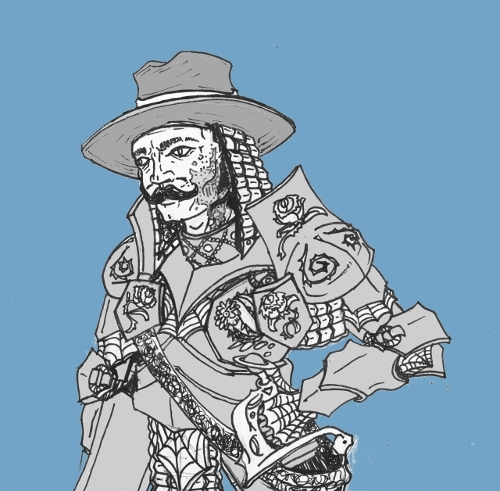 Prior to adventuring Huxley was a ne'er do well gaucho on the Certopisan Plains. He worked as a triceratops wrangler, hunter and post-rider before drifting into the less legitimate professions of rustler, strong-arm man, strike-breaker and highwayman. Over the course of his misspent years he learned passable Moktar, and it was this skill that resulted in a scheme going terribly wrong. Hux's plan to sell out both sides of a range war to a band of Moktars was somewhat successful, unfortunately the feuding ranchers were tougher than he thought and united to drive off the Moktar band. With enraged ranchers and vengeful Moktars on his trail, Huxley fled to Denethix where he's been working with a small band of adventurers and having more financial success than he expected. Hux is an obvious product of the Certopsian, with lean dessicated looking features, a pronounced accent and a tendency to use rural colloquialisms that make him appear foolish to many. Haring from the outback has its advantages however as Huxley has more marketable skills than most adventurers, he knows how to ride, and has some knowledge of fighting from horseback, driving livestock, desert survival, tracking and gun use, though he's no expert and prefers a stout sabre to firearms. Since his second to last adventure (the last into the slums Huxley doesn't like to think about), Huxley has had the opportunity to outfit himself in fancy etched plate armor, and abandoned his traditional Certopsian banded armor/beaded dinosaur leather and steel brigandine. 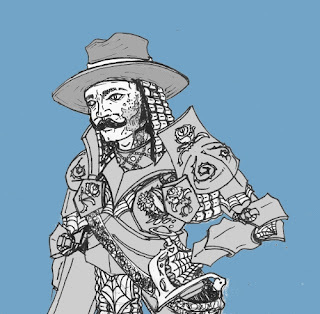 He still wears the traditional gaucho's helmet, a steel cap stitched inside a wide brimmed hat, but now has high quality plate armor of the newest denethix style, with etchings of flowers and cactus replacing the bead work on his old armor. Part of the haul from the 'tomb of the rocketmen', where Huxley also discovered the dangerous laser pistol, was a ancient sabre made of a white plastic like substance of great flexibility, strength and sharpness. Huxley has adopted the sabre as his personal weapon and it represents one of the party's first magic items and relishes it's use. Others still wonder a bit about Huxley's disproportionate strength, given his size and build he is unnaturally strong, and cannot or chooses not to offer an explanation. Note: I must say this that the doodle of Huxley is one of my favorite lately, it's nice to know that the volume of random scribbles I've been making for my players and this blog have been getting my hand and eye back in shape.